A career in the British diplomatic service motivated Christine Laidlaw to write a doctoral dissertation (University of Edinburgh) on British representation in the Levant before the establishment of a regular foreign service. The present book is based on that study. The reader will associate the title of the book with the English “Levant Company”. The subtitle seems to support this expectation and the structure of this study has indeed the Levant Company at its center. It starts out with an “Introduction and Background to the Levant Company” followed by two chapters on “Administrators” and “Chaplains”, hired by the company. The following chapter is dedicated to the “Physicians” who had actually less to do with the Company than with the Scottish enlightenment. A chapter on “Family Life and Recreation” is followed by a concluding “The Decline and Eventual Demise of the Company”. Early on in the introduction Christine Laidlaw informs us, however, that her aim is “to illuminate the living, breathing diversity of the English ‘nations’ [i.e. trading communities] in the Levant,” and also “to consider how conditions in the factories and the attitudes, objectives and fortunes have changed in reflection of this [decline of the Company in the 18th century]” (p. 5). Even earlier, in the preface, she declares another aim “to provide insights into the social structure of its [the Company’s] factories in the Levant […]”. These somewhat vague and disparate goals stand in each other’s ways. The book is neither a study of the Levant Company, going beyond Davis’ book, nor are we told, by what method the “living and breathing diversity” is to be illuminated or how changes are to be evaluated. Laidlaw uses the lives of individuals to provide us with an understanding of life and work in the major British trade settlements in Istanbul, Smyrna and Aleppo. In this attempt she succeeds best with the person of John Murray who was the British ambassador in Istanbul from 1766 to 1775 (pp. 36–74). She provides information on his family life, his various career stations in Mediterranean port cities, his travails as an ambassador in difficult political times, his social life and household abroad. His career advancements are speculatively analyzed by discussing various family alliances and divisions in England (p. 59). His difficulties in Istanbul were obviously the result of the difficult relations between England and the Ottoman Empire at the time (pp. 65–67) and the problems of running a large official residence on a small budget in a foreign place seems to have been not different from any other foreign place – at least nothing specifically “Levantine” can be noted. The frame of reference is so personal, that the narrative remains anecdotal and borders at the gossipy. Chaplains were not to proselytize in the Levant but to take solely care of the spiritual issues of the trading communities. Christine Laidlaw raises the justified question why chaplains would want to go to serve small, isolated communities in the Levant in the first place. Here, the biographies serve her well to find answers. Some came in the hope to trade for their own account; some wanted to see the Holy Land; many had academic interests and frequently returned to academic careers in England. In the Levant they furthered their careers by becoming collectors of Arabic manuscripts, antique coins, Greek and Latin inscriptions on ancient ruins, unknown plants or languages. These activities reflected the spirit of the European exploration of the world and the enlightened attempt of the systematization of knowledge. Similar scholarship, though turned understandably more to the natural sciences, was displayed by several of the British physicians that served their countrymen and others in the Levant. Laidlaw gives a short analysis of the medical schools in Scotland and their role in the Scottish Enlightenment. Discussing the biographies of these Scottish doctors she gives rightly most space to the Russell brothers and their unique work on the city of Aleppo. It was unique in the sense that its object was a city, its culture and its society as the Russell brothers observed it at their own time. Laidlaw, however, fails to rise to the occasion and to discuss the question why the Russell brothers took such an interest in the contemporary Levantine society or, to put it differently, why this interest was so obviously lacking in their compatriots in the Levant, e.g. the chaplain Drummond’s hatred for “the Turks” (p. 101). To Laidlaw the aspect of the “Perception of the Ottoman Empire”, although mentioned in the subtitle, seems to have been of no interest. Only at the very end of the book she speculates, that there must have been constant social interactions between the British and the local suppliers, artisans, landlords etc. “Such contacts,” she writes, “small and insignificant in themselves […] must collectively have been a valuable step towards greater trust and understanding” (p. 223). In the absence of any evidence, the reader is entitled to strongly doubt this assumption. The chapter on “Family Life and Recreation” provides information on individual marriages, deaths, births, on the shortage of women and the limited options for entertainment. What becomes evident and again is not analyzed, is the complete separation from the social life of the surrounding Levantine society. There were obviously contacts with service men and women, but any sort of social contact with merchants, learned men or high officials and their families was extremely rare. The book reads well and is entertaining. But it is of more interest to the reader of British history than to the scholar of the Ottoman Empire, the Levant, or trade in the region. The society and the politics of the Levant region remain a vague and detached background. Ralph Davis, Aleppo and Devonshire Square. English Traders in the Levant in the Eighteenth Century, London 1967. 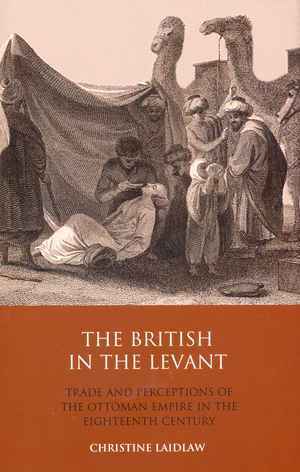 Thomas Philipp: Rezension zu: Laidlaw, Christine: The British in the Levant. Trade and Perceptions of the Ottoman Empire in the Eighteenth Century. London 2010 , in: H-Soz-Kult, 28.11.2011, <www.hsozkult.de/publicationreview/id/rezbuecher-16854>.